Seven years into the crisis, the massive needs of displaced populations continue to grow. Families have now mostly depleted whatever resources they managed to flee with at the start of the crisis. They face increased debt, financial pressure, shrinking resources and limited opportunities for generating income. Many are struggling to survive and meet basic needs, which sadly results in an increased reliance on negative coping mechanisms, like early or forced marriage, child labor, domestic violence and exploitative labor. Facing similarly dire circumstances, countries hosting refugees are experiencing increased pressure on already overburdened social, economic and political systems, resulting in a scarcity of resources and growing tensions between the diverse communities residing within Jordan and other countries in the Middle East. The consequences of displacement are long-term and generational. Recognizing this complexity, World Relief come alongside these communities to build their capacity to find practical and sustainable solutions to their needs; solutions which address the root causes of the issues affecting their communities, not just the consequences. The foundation of all of World Relief’s work in the Middle East is the belief that affected communities are in the best position to strategize and implement effective and relevant solutions that will endure for generations. Together with the community, World Relief has developed a unique framework that seeks to engage and strengthen the whole family, both as individuals and as a family unit. By targeting entire families through both individual and joint programs, World Relief desires to see vulnerable refugee families and receiving communities healed, safe and thriving, despite the incredible pressures they face. World Relief’s programs target women, men, boys and girls in a diversity of programs, designed to help promote safe, healthy and thriving families. This has proven an effective strategy in meeting the diverse needs of vulnerable families, but also in protecting women and children, who are disproportionately endangered by violence and displacement. Child Friendly Spaces: World Relief provides designated safe spaces where displaced children can come to play, learn and recover some of the essential developmental activities of childhood, with the support of trained facilitators. Sessions include exercise, health, school skills and life-skills. Literacy Support: The diverse and significant barriers that children and adults face when they flee their homes as refugees contribute to significant literacy gaps, poor motivation, and an increased risk of negative coping mechanisms. Recognizing this threat, World Relief provides Arabic and English literacy support to illiterate adults and children who are struggling to keep up in school. Girls’ Empowerment through Sports: In partnership with the Ministry of Education, this program provides vulnerable Jordanian and Syrian girls with access to sports. Teachers in local schools are equipped to be coaches and provide practical soccer skills as well as life-skills training to girls in the program. Caregiver Support Groups: Psychosocial counseling and support groups are made available to displaced women, particularly focused on mothers or caregivers. Positive Parenting: Our parenting group uses a curriculum that promotes positive parenting skills to promote healthy and supportive family environments. This curriculum is designed for use with both men and women, emphasizing the need for men to also engage in positive parenting. Marriage Strengthening: Refugee couples often face significant marital challenges catalyzed by the extreme pressure and trauma of displacement. Early marriages as well as sexual and gender-based violence (SGBV) still exists in many places. World Relief has therefore developed a curricula for men and women on important marriage topics, and is piloting this with both men and women. This is often the first time men are learning and listening to the women’s perspective on important family related topics. We are so encouraged to see how our staff and volunteers are leading these programs and seeing transformation take place in individuals, within families, and in entire communities. While the needs are many, we have great hope when we see the resolve and commitment of the communities we serve. Healthy families create healthy communities, which in turn form nations. 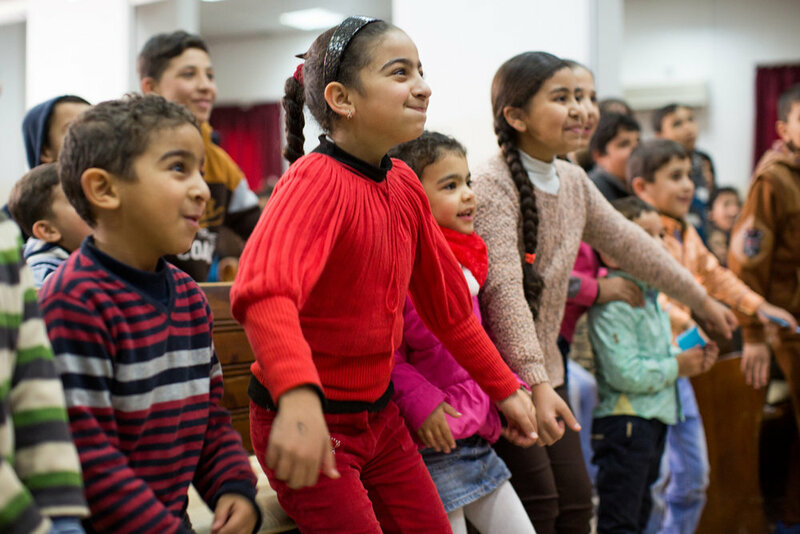 We continue to believe in restoration, healing and thriving futures for families and communities across the Middle East!